How to plant out carrot seeds in pots and containers in your garden. I explain how to space out the seeds and how long it takes for them to germinate and then grow into mature carrots. Planting seeds and harvesting carrots in pots is ideal for small gardens and patios so you can enjoy growing vegetables when you have very little space. 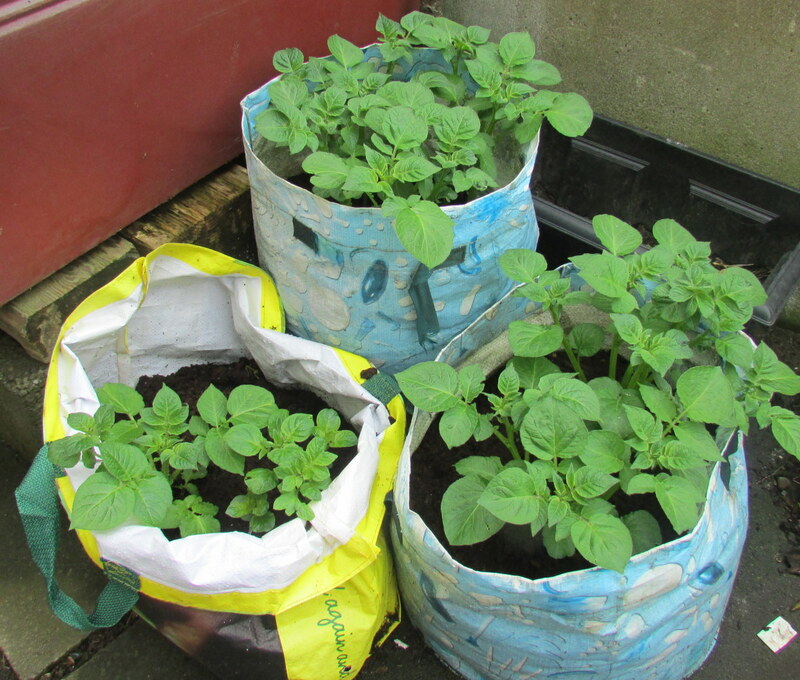 You can use large bags or pots for this purpose. 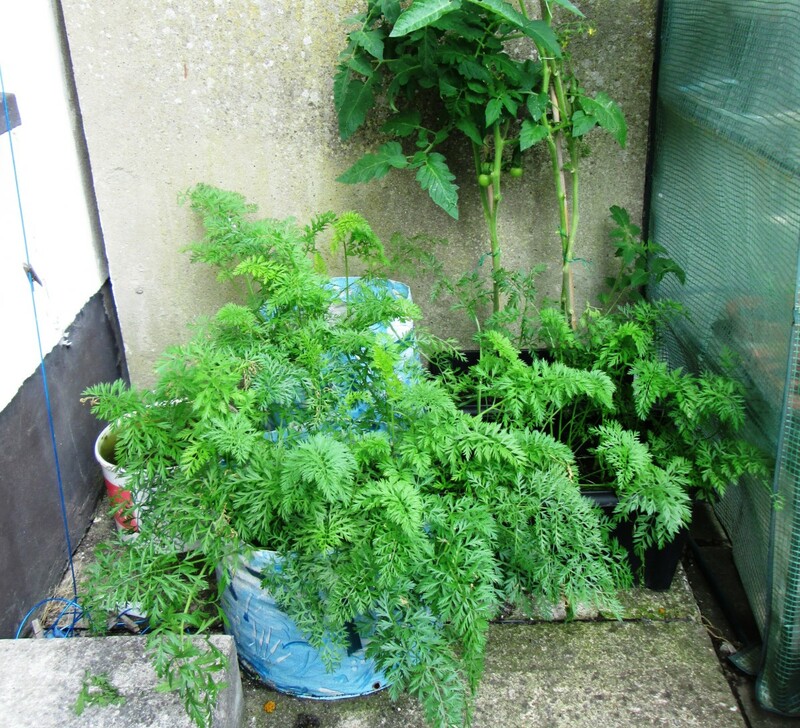 Last year I grew my carrots in special gardening plastic containers and they were very successful. I was able to place the four containers in the patio area where the best of the sun was utilized. The packet of carrot seeds I bought the year before last is called Burpee Short 'n Sweet Carrot. There are 3000 in each packet. 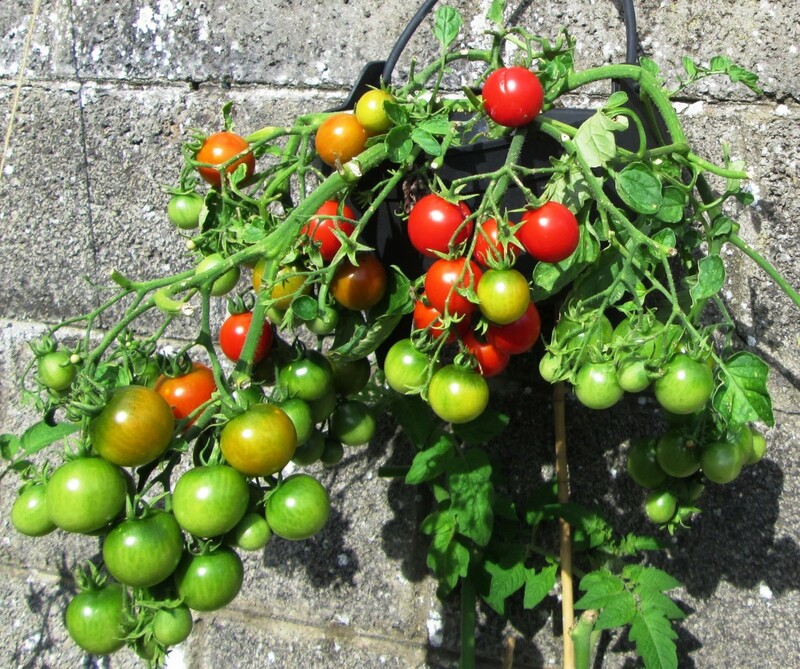 They have always given me a great harvest and are ideal for container gardening. Because there are so many in each packet they last me a few years too. As carrots are a root vegetable it is important that you prepare the soil properly. If you get this part wrong then your carrots will be doomed before you even sow the seeds. The soil should be loose and sandy with no wet heavy clay or stones. The carrots need to be able to grow down into the soil without a struggle. If you can afford it the best soil to put in the containers would be newly bought compost. Fill the containers with the soil leaving at least ten inches at the top free. 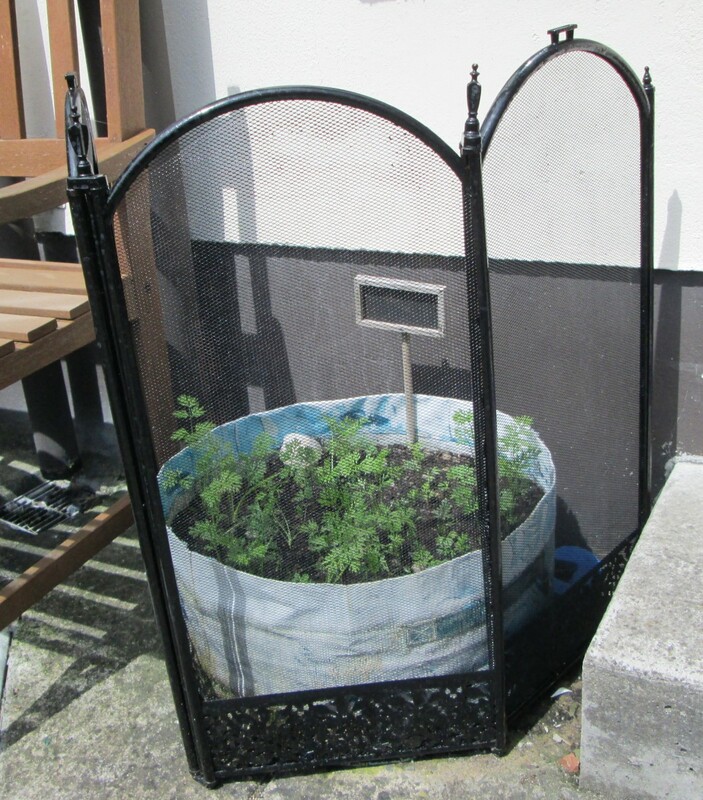 This is to protect them from carrot fly once they start to grow the leaves. Early crop carrots are sown in Spring which is March or April here in Ireland. Depending on the weather wait until the last frost has come and gone. The carrot seeds will not germinate in cold soil. Sow the seeds in one container first and then wait for two weeks before you sow into the next container. This will give you a staggered harvesting time. 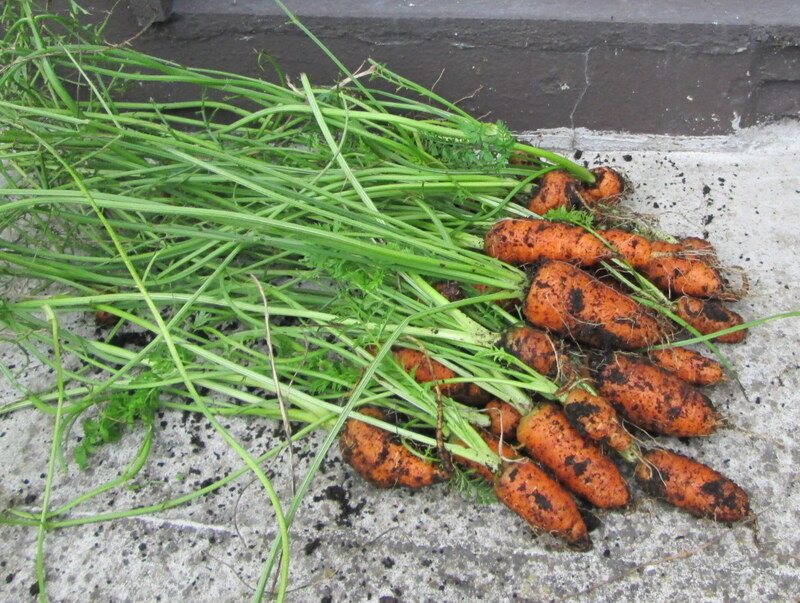 With Early Crop carrots if you have the room you can continue to sow at two weekly intervals right up to late summer. Main Crop carrots should only be sown until the middle of summer. Water the containers very well the day before you plan to sow the seeds. 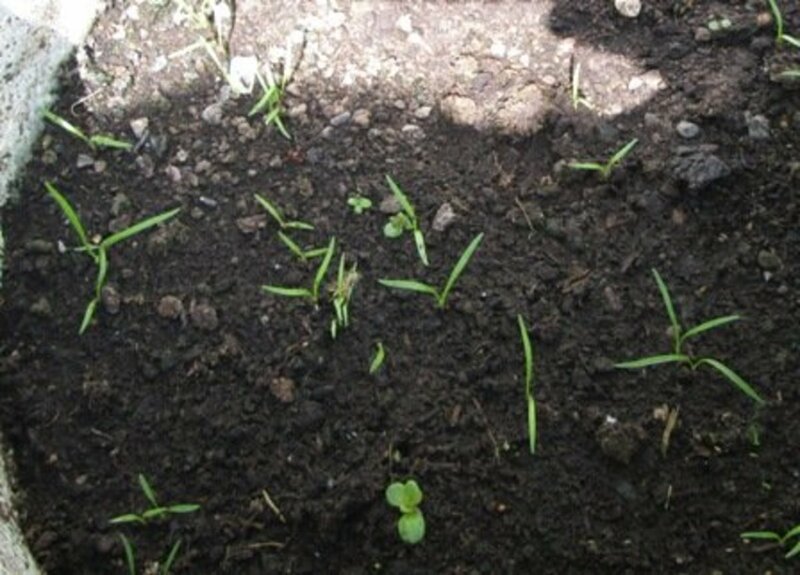 Carrot seeds are very small so try to sow them as evenly as possible. This will stop wastage when it comes to thinning them out. Sow the seeds in small rows in your containers. 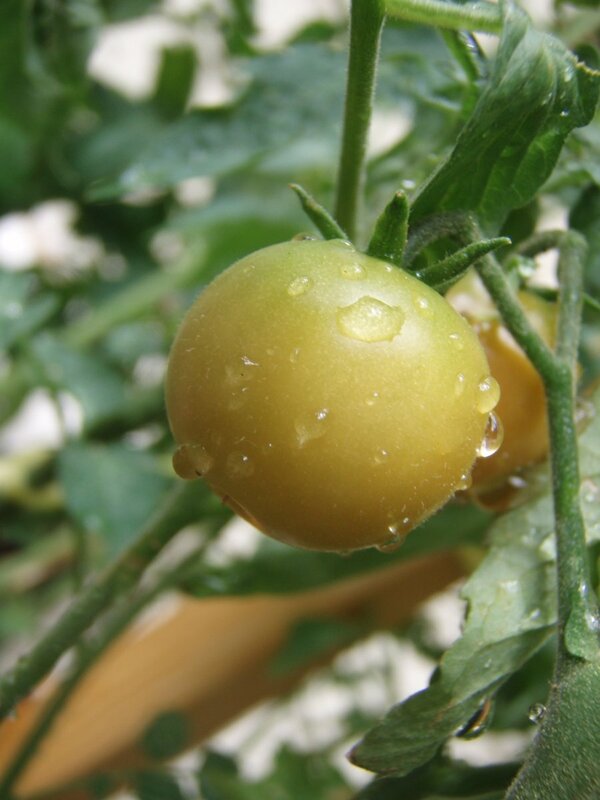 Cover them with a fine shower of soil and firm down with your hands. Give the soil a sprinkle of water using the spray of the watering can. 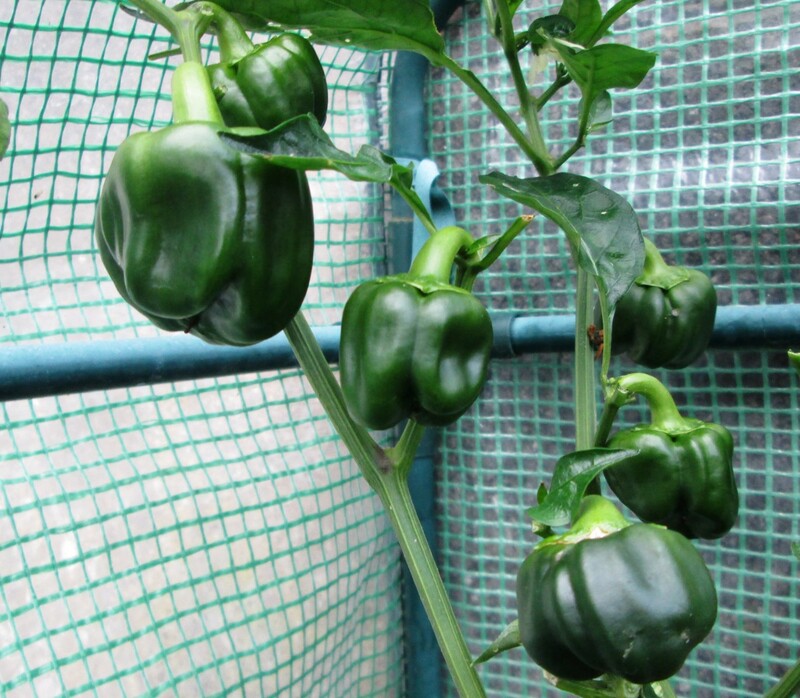 It will take from two to three weeks before you see any shoots appearing in your containers. If it has been cold for more than a few days it could take longer. 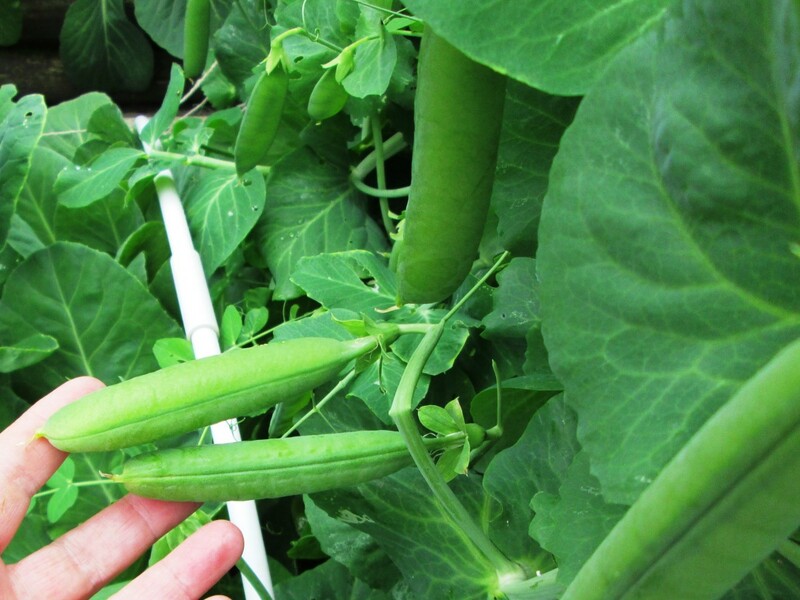 Once the shoots are about one inch or two and a half centimeters high then you should start to thin them out. Where there are groups of shoots lift them gently from the soil and place them evenly back into the container. If the shoots are very close together then remove each alternative shoot. It is best to have carrot plants two inches apart once they have been thinned. I had a fourth container ready when I thinned my carrots and replanted the shoots that were not needed into this one. Some of them did not grow but most did. Make sure to thin the carrots in the evening. 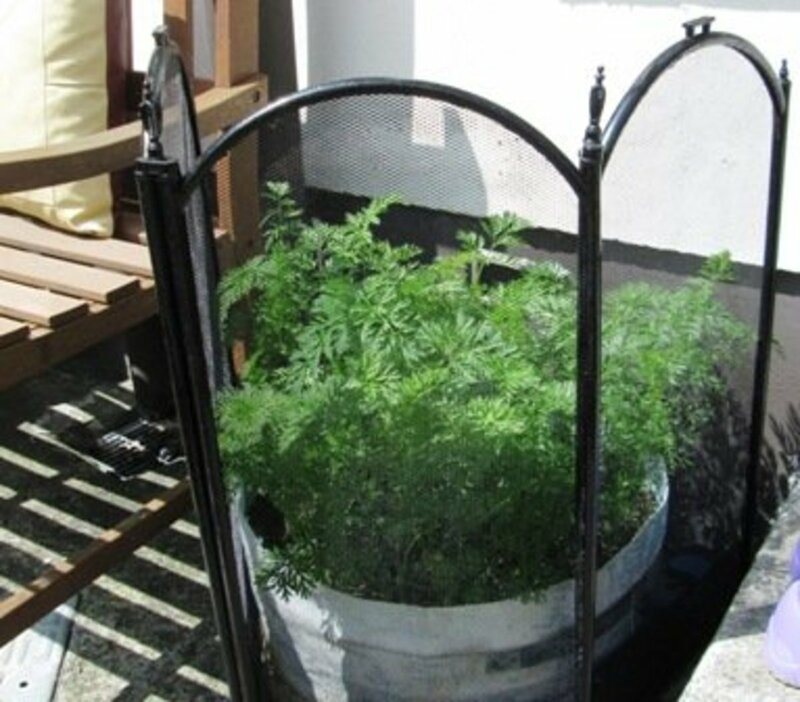 This will help you avoid any carrot fly attacking the carrots.All the carrot plants that you have thinned and do not want must be gathered up and placed firmly in the middle of your compost heap or thrown into a bin and covered. It is the smell of the leaves that attracts the carrot fly. Firm the soil around the carrots gently and water lightly. Carrot fly and caterpillars are the enemy of your carrots. If you follow the instructions above when thinning the carrots you will not attract the carrot fly. Once your carrots are growing nicely and you have an abundance of green leaves you must also take some steps to ensure they are protected. The containers can be surrounded by a make shift fence or shield. For one of mine I used an old fire guard that was rusting in the shed. I painted it up and placed it around the plants. My dog Lexie was also prevented from damaging them with this method. You could also use a netting attached to the wall that can be thrown over the container and plants. Caterpillars attacked the leaves of the container that was surrounded by the fire guard. They ate them all. I pulled the carrots up immediately but some were not fully grown. The carrots that had the netting over them were not eaten and I was able to leave them to grow to maturity. Watch out for any carrots where the orange heads are showing above the soil. 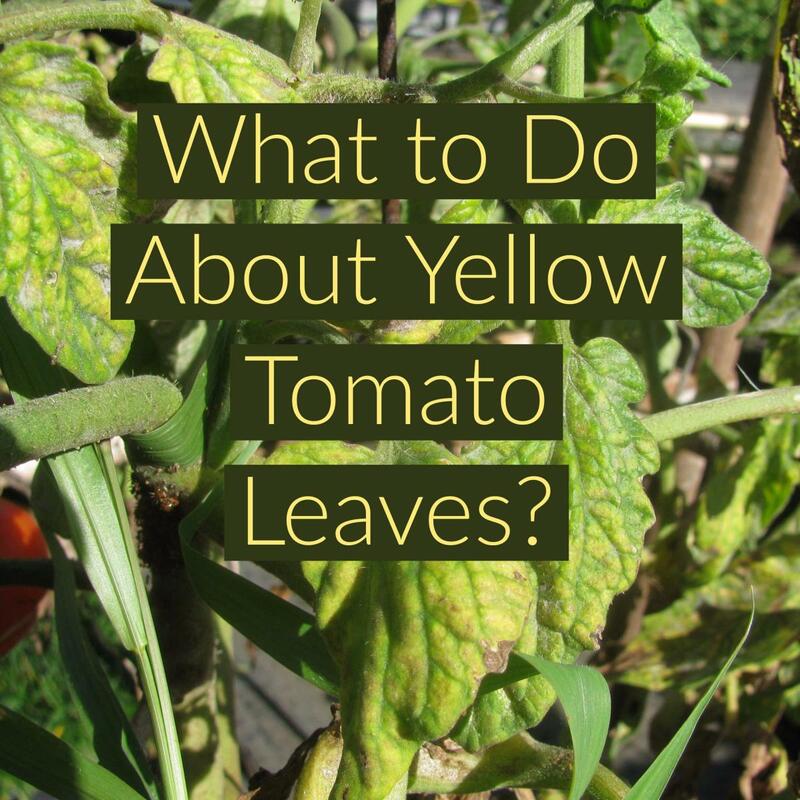 Cover them with soil immediately otherwise they will turn yellow and be uneatable. 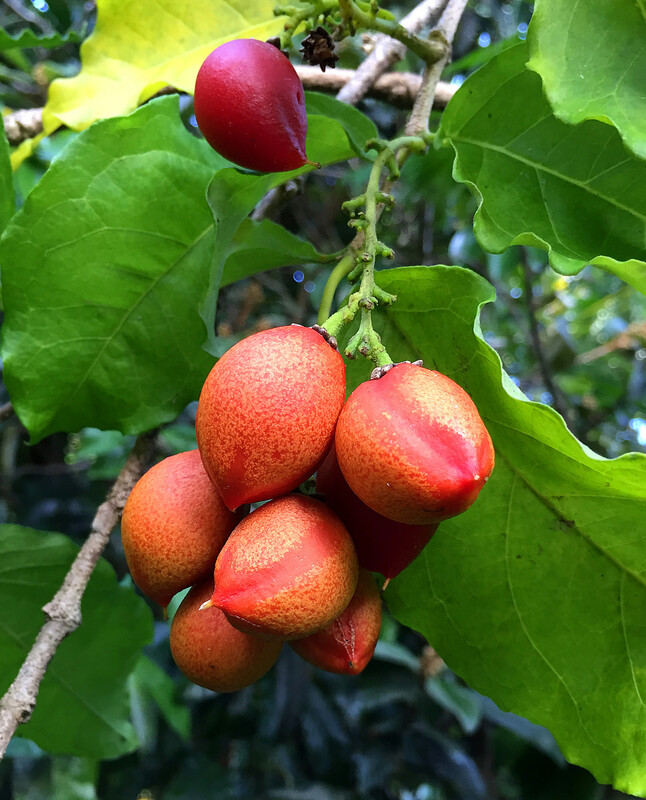 The early variety can be picked one or two at a time for use in salads and to eat raw from early summer. They will grow to maturity by the end of the summer. Main crop carrots will be ready to pull up by the early autumn. When the outer leaves begin to wilt and the inner leaves curl up then you know they have stopped growing. This is the time to harvest them. Always pick them on a dry day and in the evening. Use a hand garden fork and gently loosen the soil around the plants. Lift them all and then cut off the foliage immediately. Store the excess carrots in a large tray or box in a dry shed. Brush off any excess dirt but do not wash them until you are going to prepare them to eat. You can make home made coleslaw with your carrots from the garden. Once the carrots are a reasonable size you can pick a few at a time and they will be fresh and juicy. 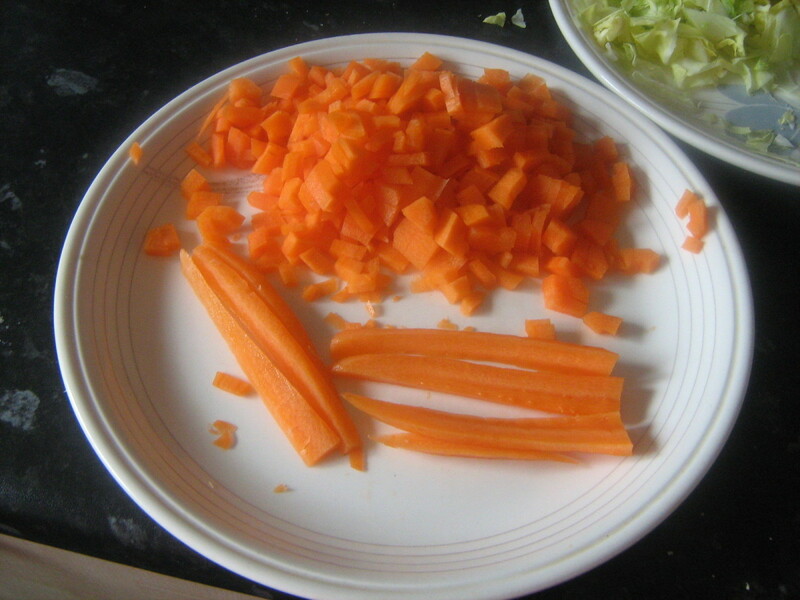 Peel the carrots and cut up into small squares. Peel the scallions and cut off the root end. Chop up into small pieces. Take a handful of each vegetable and place in a dish and then repeat the process. This will give you a good mix. 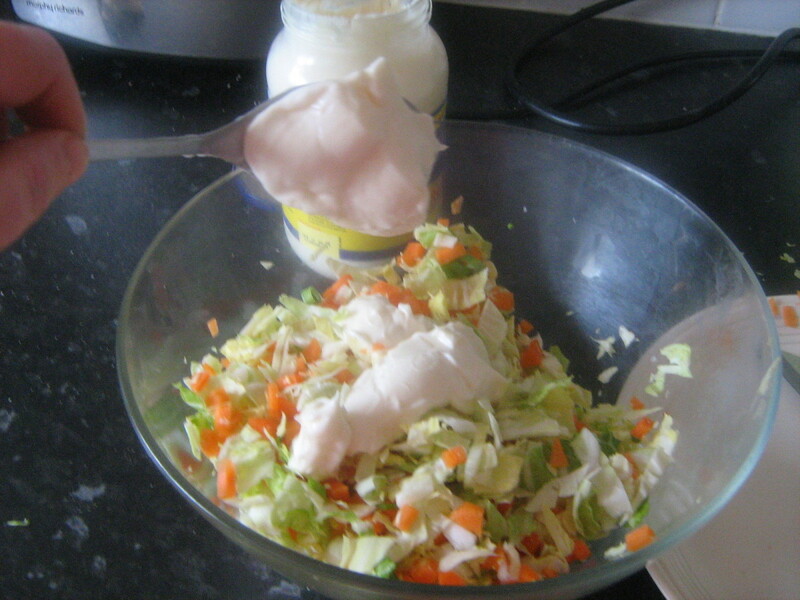 Using a dessert spoon add the mayonnaise and mix in well. You can make coleslaw the day before and put it in a sealed container in the fridge. Do not add the mayonnaise until an hour before you are to serve it. 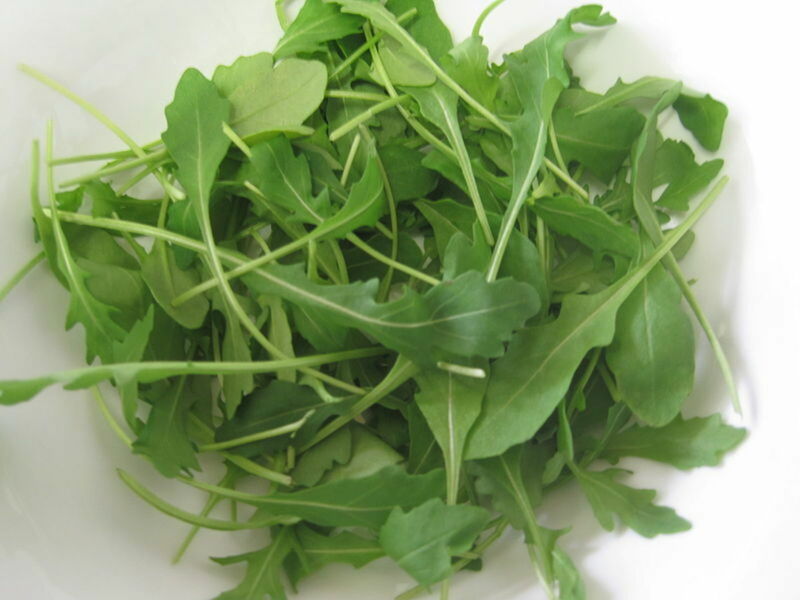 Chop them up either in circular pieces or in long strips. Put them in a pot with boiling water. Bring to the boil and then simmer for twenty minutes. Add a small piece of butter to the carrots and replace the lid. Shake the pot to distribute the butter over all the carrots evenly. Serve hot as a vegetable to accompany potatoes and meat. 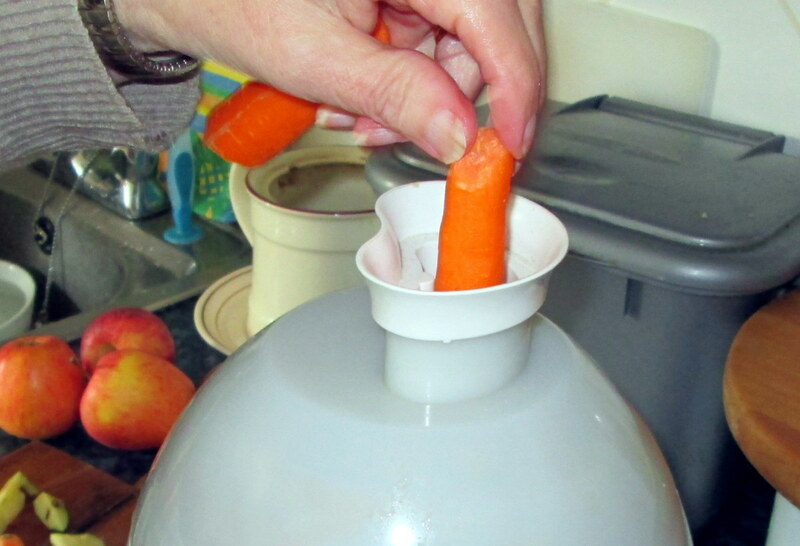 If you own a juicer then raw carrot and apple mixed together make a very nice drink. They are cheap enough to buy and worth it to be able to make healthy drinks. If you have children they can taste a combination of fruit and vegetables in different drinks. When are carrots ready to harvest? Carrots are ready to harvest 50 to 60 days after planting the seeds if they are baby carrots. It takes around 75 days if your variety of seeds are mature carrots. They can be ready after around 11 weeks of growing. They can be harvested a little earlier if you prefer your carrots to be smaller. How deep should you plant a carrot seed? Even with a tiny garden kerlund74 you can have vegetables growing in boxes or containers. My garden is quite small but I have a very large concrete side yard. This is where I plant a lot of vegetables in pots, boxes and other containers. Thanks for the votes and shared it is much appreciated. Really useful hub! Voted and shared. I have a tiny garden and a huge interest in planting flowers and vegetables. Yes MizBejabbers carrots can be grown very successfully in containers but if you want to grow them in the ground you can protect them from garden pests by growing them in between rows of onions. RTalloni it is great when the carrots begin to germinate and grow. The leaves look good in the containers too. BNadyn you should grow your own carrots this year because they really do taste a lot better. Yes tirelesstraveler it is the time of year to plant the carrot seeds as it will take up to three weeks for them to germinate. Pamela99 3 if you protect the carrots in your pots then you should be able to avoid the pests. If you plan to grow them in the ground then plant them in between rows of onions. rebeccamealey 3 yes they do taste a lot better than shop bought carrots. 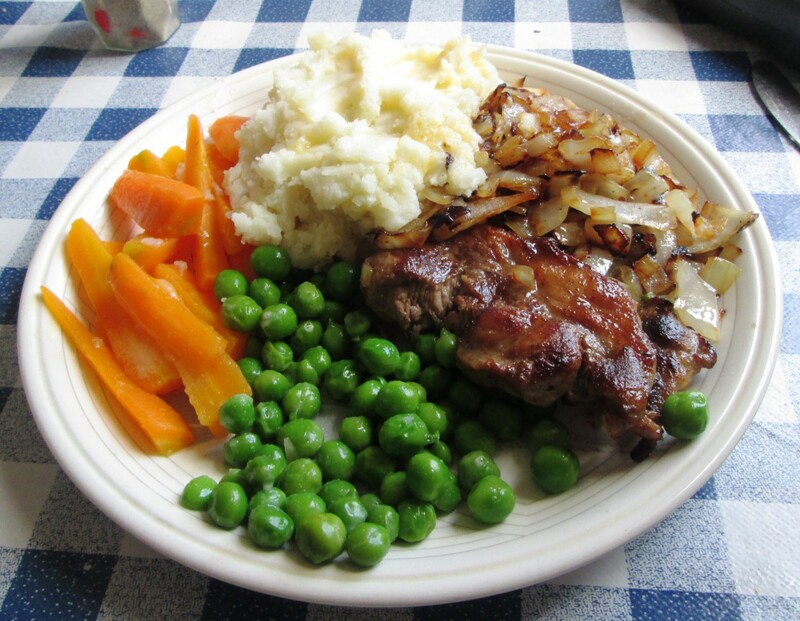 The shepards pie is quick and easy to make and is a great dinner to make when you are busy. Such a useful hub, we eat plenty of carrots at our house so I have considered growing them myself. Great information here! Thanks for this useful look at growing (and using) carrots. I am thinking of trying them this year and found this helpful and interesting. Your carrots are awesome looking. I'll bet they taste better than store-bought. The sheppard's pie looks delicious! Excellent hub and great idea, thanks! I like the idea of growing my own carrots. One problem in northern FL is the vast number of bugs, which is a concern. I like the way you protected your crop however, so maybe I could do the same. Very useful hub! Lovely ideas. I have just the pots for growing carrots. Must get them in soon or it will be too hot until fall. Hello Phyllis I have a small garden but quite a lot of room on the concrete lane way so that is why I tend to grow a lot of vegetables in containers. Yes it is very frustrating when you want to grow veg and have no room. No I have not tried that recipe but I will give it a go, thanks. My next hub is about growing lettuce and the one after that will be growing spring onions/scallions so you will have to become a genius at saving space on your patio. My gosh, Viking -- you make me wish I had a big back yard, or at least a larger patio. I get a lot of sun on my patio but am running out of room with all your hubs inspiring me to plant vegetables. This is a great hub, well-written and with great tips/information. I love carrots. Have you ever tried the carrot recipe: Tzimmes? It is so good. They come out glazed with honey and butter. Awesome side dish ! Thanks for another wonderful hub.